John (thinking to himself) There is nothing to take a picture of around here, especially with this camera. I can’t believe she gave me this thing, it’s got a crop sensor, every pro I’ve read about uses a full frame. And it’s red! What real photographer uses a red camera? Black is so much more professional. All these flowers? Might as well be a tourist with an old IPhone. All those awful colors. A real photographer wants dark and gritty. That’s what’s cool now. I can’t believe how much it cost to park at this place. We could have stayed home and watched house flipping shows. The weather is so bad, overcast and cold. Who wants to be outside on a terrible day like this. Jane (thinking to herself) He hasn’t looked at me all day, really looked. I gave him that camera, worked overtime for months to save enough for it. You’d think he’d take a picture of me. I’m wearing my Uggs – he loves it when I wear my Uggs… at least when I wear only my Uggs. Maybe that’s it. And my red scarf, the one that my aunt knitted for me. Wouldn’t it go well with the colorful flowers? The flowers are so beautiful, especially all the tulips. They remind me of home. I had hoped this would be a special trip. All he wants to do is to watch other people fix up houses on the television. And the weather is so beautiful, no burning Texas sun and it’s nice and cool. Who can resist a day like today? 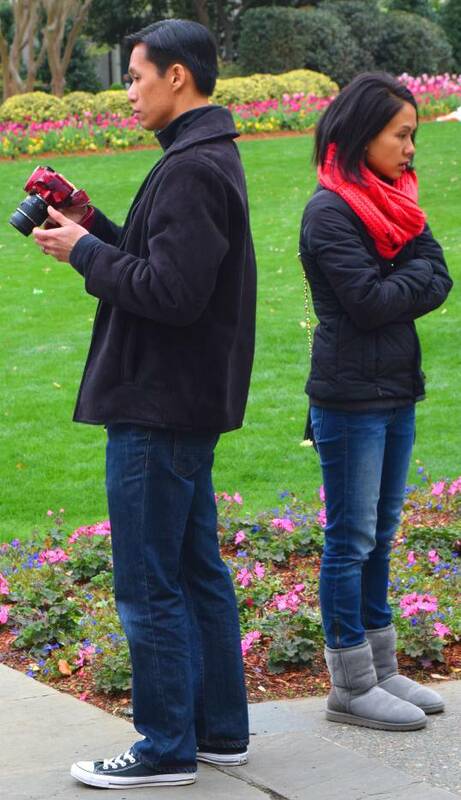 This entry was posted in Photography and tagged arboretum, couple, Dallas. Bookmark the permalink.